You may have heard about a new, dinosaur-themed park coming to Lake George, but do you know what’s happened to the iconic Uncle Sam statue? And how the Magic Forest park will be incorporated into this new park? Read on to find out the details. 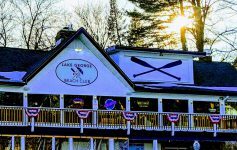 Longtime residents and visitors of Lake George will undoubtedly be sad when they realize the beloved Uncle Sam statue that was such a significant fixture of Magic Forest is gone. But in fact, he’s actually returned home. 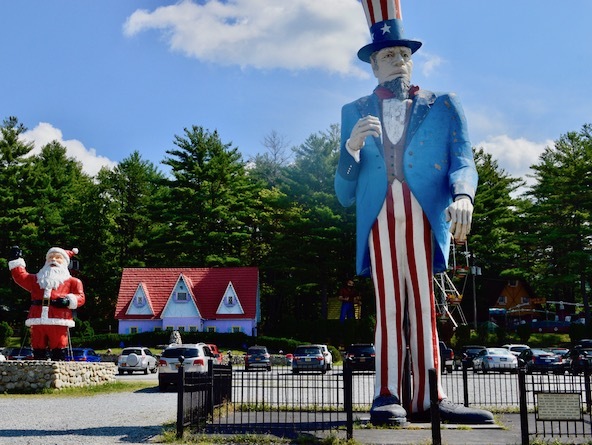 The 38-foot-tall Uncle Sam has been returned to its original location in Danbury, Connecticut. Jack Gillette, the longtime owner of Magic Forest, initially purchased Uncle Sam (and other pieces) at auction from the Danbury Fair decades ago when the fair closed its doors in 1981. Returning the statue to its original home was part of the deal. 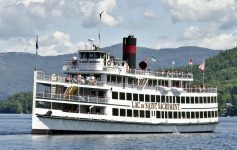 Transferring the giant statue from Lake George to Danbury, roughly a three hour ride, was reportedly difficult. Officials ended up tipping Uncle Sam onto a 40-foot flatbed truck, and had to remove one of his hands to avoid it getting torn off by a bridge along the route. Restoration specialists will be working to spruce him up from the wear and tear he’s endured over the years. He’s believed to be the largest Uncle Sam statue in the world. Fear not, Magic Forest lovers – the new Lake George Expedition Park will be adding onto the Magic Forest park along Route 9 between Lake George and Queensbury. The new park will transport viewers to prehistoric times with animatronic dinosaurs, a Dino-Roar Valley, and more. Magic Forest’s rides and layout will mostly remain the same, except for the removal of Uncle Sam and a few other fixtures, including animal statues; 23 of the 25 rides will remain in operation. The former safari area will see the most changes. Ruben Ellsworth, owner of Ellsworth & Son Excavating in Fort Ann, purchased the Magic Forest amusement park from the Gillette family, who has operated the park for nearly 60 years. Jack Collins is slated to be the General Manager and COO of the new park; he brings experience working as the General Manager of the Great Escape and has also consulted with Santa’s Workshop in Wilmington. The park is expected to be open May through October, with tickets going on sale in March. 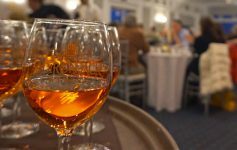 Previous Article Enjoy the Snowy Weekend in the Lake George Area!